The UK's fastest selling hymn book is now available in a large print edition, with its design an dlayout approved by the RNIB. 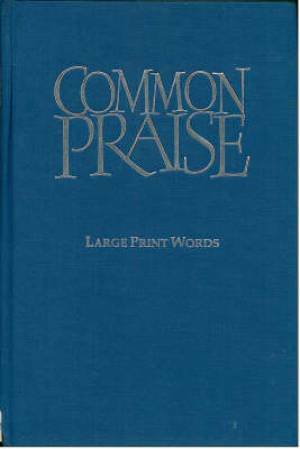 Over 50,000 copies of "Common Praise" are now in use in almost 400 parishes. Containing 630 items, "Common Praise" is a comprehensive collection of the very best of the church's music, from earliest sources to the present day. Included are the great hymns of the past, metrical psalms, modern songs based on Scripture and over a hundred hymns from the 20th century including John Bell, Graham Kendrick and writers from other countries, including North America and Australia. There is musical innovation as new tunes and arrangements are introduced, and familiar words and music are brought together in new associations to the enrichment of both. Where appropriate, inclusive language has been introduced. For churches using the "Common Worship" or "Revised Common Lectionaries", choosing appropriate hymns has never been easier. Arranged to follow the Christian year, the selection of hymns will be further helped by "Common Praise's " extensive indexes. A&M Common Praise Large Words Ref No. 41 was published by Canterbury Press in March 2002 and is our 18967th best seller. The ISBN for A&M Common Praise Large Words Ref No. 41 is 9781853114670. Be the first to review A&M Common Praise Large Words Ref No. 41! Got a question? No problem! Just click here to ask us about A&M Common Praise Large Words Ref No. 41.